Below is an excerpt from the Field Notes of the Andronikov expedition to inspect the black mat in Europe. At a site just west of Lommel, Holland they find an intriguing feature (above) that some interpret as possibly being a signature of an ancient tsunami at the onset of the Younger Dryas. I located on Google Earth what appears to be the archeological site where they took the samples and then I plotted the distance to the sea. 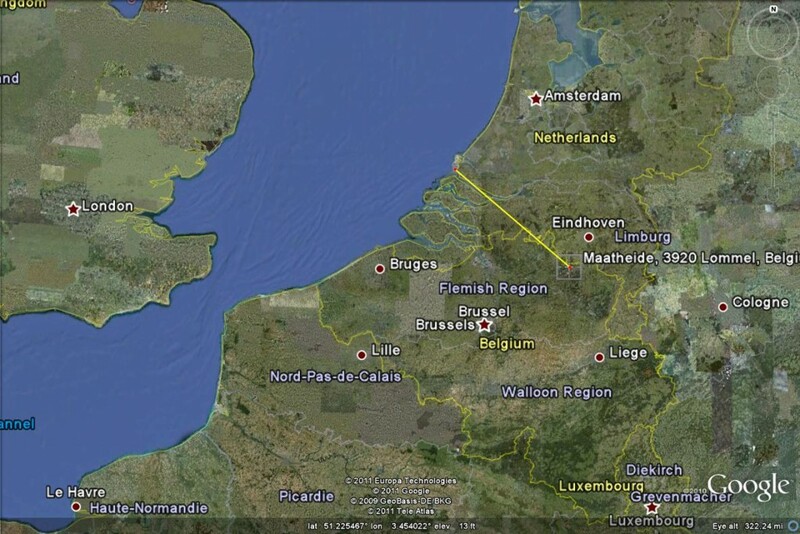 The Lommel-Maatheide site is 70 miles from the sea (a very flat seventy miles). I have needled these Dutch guy’s in the past but the Tusk is warming to them. From the field notes it seems they are keeping an open mind — and speculating. Good stuff. Lommel-Maatheide is the exact site where Tian et al. (2010) reported a presence of nanodiamonds from around the Usselo Horizon. At this site, the Usselo Horizon represented by the organic-rich dark material distinctly shows a transition from being a land originated close analogue of the black mat of North America (samples 2 LOM11; Fig. 16) through the peat-bearing material generated in thewet environment (samples 2A-LOM11; Fig. 17) to the sheer aquatic-related Usselo Horizon represented by a thick (20-30 cm) layer of peat (samples 2B-LOM11; Fig. 18). A very interesting and unusual structure of the disturbance can be observed in a peat layer of the Usselo Horizon(Fig. 19). This structure was interpreted [sic] as a possible fingerprint of a paleotsunami. Providing the age of the Usselo Horizon, such a tsunami might be related to the impact in question. Other interpretations related for example to the permafrost, however, are also possible. But the origin of the observed structure should be a matter of an independent study and in the moment is beyond the scope of our work. 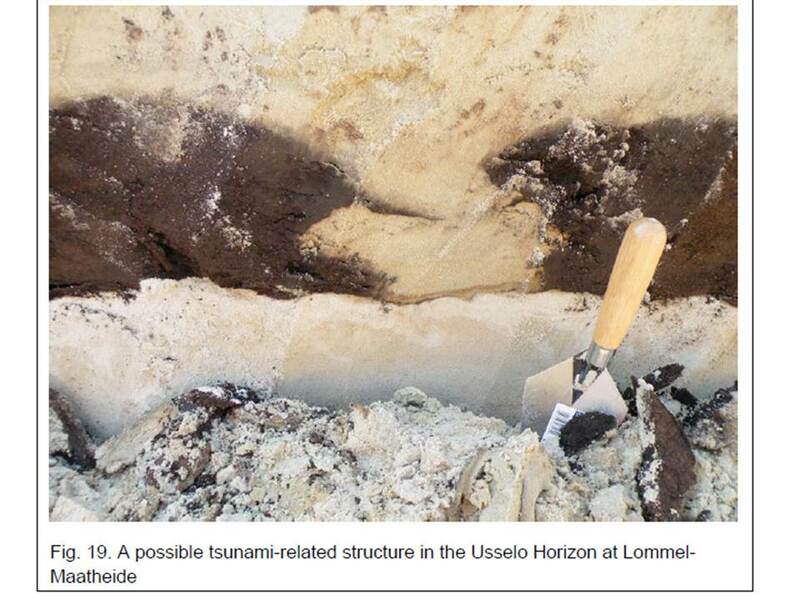 All three cross-sections of the exposed Usselo Horizon sequence in Lommel-Maatheide where sampled for the material from the Horizon itself, and from the over and underlying sediments (Fig. 20).